Conventionally, measurement of the harmonic distortion required special modes or lengthy data acquisition times which impacted the processing time on manufacturing lines. New power meters can obtain the harmonics, harmonic distortion, and other data such as voltage, current at intervals as short as 100ms. This increases the efficiency of manufacturing on production lines with short process cycles. In order to reduce oscillation of harmonic current from such products, it should be tested with very accurate instrument according to IEC standard. 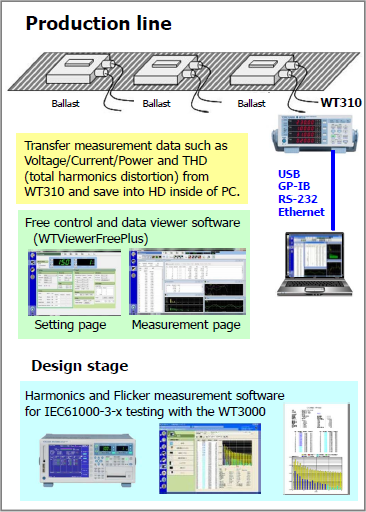 Our WT3000E and 761922 software fit the requirement. Simultaneous Harmonics (DC-50th order) and Total. 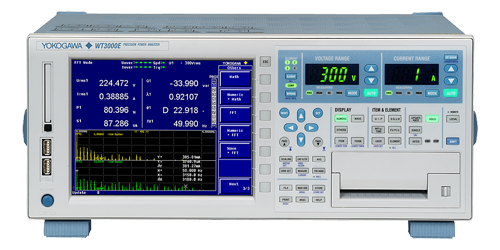 High Accuracy power consumption measurement: 0.1% of reading. High speed update rate: 100ms interval with all channels. Wide range communication interface USB, GP-IB, RS-232, Ethernet. Simultaneous measurement every 100ms and variety communication interfaces. RMS, DC, AC and VMEAN of voltages and currents simultaneously don’t switch without measurement mode. it is possible that data monitoring of all measurement items and data recording by WTViewerFreePlus.